Summary: A little black dog finds a red umbrella on a windy day. The wind carries the umbrella and the dog all over the world. Using only pictures to tell the story, The Umbrella is sure to captivate the imagination of young readers—especially since they can “read” it all by themselves. The letter U is a fun letter to roll out of playdough. We made giant U’s and practiced saying the sounds letter U makes. We also read our poem and finger-traced the letter U’s on the handwriting sheet. After reading the book, we made our own little umbrellas from tissue paper and contact paper. I taped a medium-size piece of contact paper sticky-side up onto the table. My little girls covered the contact paper with the tissue paper. After the piece of contact paper was covered, I traced the shape of an umbrella and cut it out. I punched a hole at the bottom and twisted a piper cleaner through to be the umbrella handle. We hung out umbrellas on the front door along with a tissue-paper letter u. 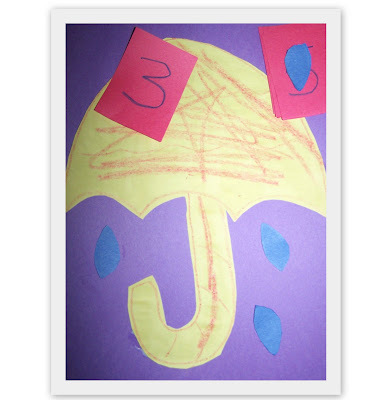 In a past Totally Tots post, Shannon shared a cute raindrop game to go along with the umbrella theme. Jolanthe shared a letter U umbrella craft which ties in perfectly with this theme. Erica has a ton of umbrella-themed printables available to download and print. What a great idea for "U"! I've done these with different shapes, but never an umbrella! Thank you! I love the little umbrella on your window! We will try this on a rainy day for sure! These are such great activities. I was home-schooled, but not until after third grade, so my mom had the older curricula to worry about. I wanted to let you know about a project we did when I was 10, which was to write a story with dolphin facts (because I loved dolphins!). Now, seven years later, it's been published! I write more about the process on my blog http://demiandthedolphins.authorsxpress.com. I would welcome your thoughts!